1. Does your mobile partner have multi-platform experience? In the past, when developing web or desktop applications, one or two robust versions of the application would be enough to accommodate users of most browsers and operating systems. However, there are many different form factors in the mobile marketplace, including the iPhone, Android, and BlackBerry. Tablet devices such as the iPad also require a high level of expertise and know-how. When looking for a mobile developer, find one who has experience in accommodating these multiple form factors. Failing to do so could alienate a significant portion of your potential users. 2. Can your mobile partner provide back-end system integration? Many mobile developers are versed in creating isolated applications packaged for general use. But it is critical that the architecture of a mobile application connect to the back-end systems of your organization. That's because a generic application creates a disparate gap between theapplication and your existing systems, forcing parts of the application to be recreated in order to use them with any effect. A mobile developer needs to be able to assess your existing architecture and ensure that the mobile application is uniquely designed to seamlessly integrate with your existing back-end systems. 3. Is your mobile partner capable of contributing new ideas to your mobile strategy? Mobilizing is more than simply taking your existing content and features and making them accessible on mobile devices. Because at its foundation, this new platform is about more than mobility. It's nothing short of a game changer that is radically redefining the way users interface and interact with applications. Businesses that fail to design for the uniqueness of the platform do so at their own risk. When choosing a mobile developer, go with one who is able to show you how mobile technology can be used to develop unique applications that utilize the platforms' features, such as touch interfaces, location awareness, and application connectivity. 4. Is your mobile partner a business solutions architect? 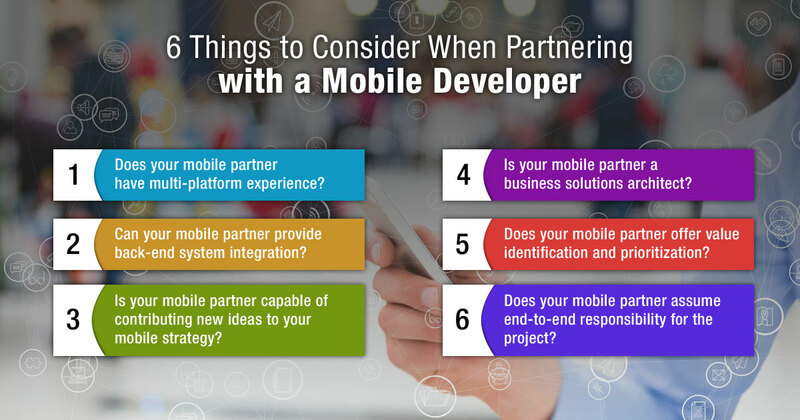 A mobile development partner should be bringing additional value and insight to a project. If a mobile developer simply builds what you tell them, they're fulfilling the role of a product provider, not a solutions partner. 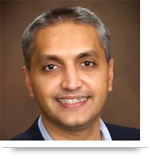 "A mobile technology partner should be a partner in the truest sense of the word," asserted Jagani. "They should be bringing ideas of their own around your objective that include unique insight from a mobile technology expert's perspective." Even if you possess a basic concept of the application and its purpose, it is the role of the business solutions architect to help you expand on the concept to make it the very best it can be. 5. Does your mobile partner offer value identification and prioritization? Let's face it. At the end of the day, every business has a mandate to ensure a positive return on their investment in mobile technology. A reliable mobile development partner plays a critical role in achieving ROI by identifying the lowest hanging fruit and discouraging extra features that won't yield benefits worth the time and effort to create. According to Jagani, "It takes the understanding of both a business solutions architect and a software architect to successfully develop an effective mobile solution. Without both, it's unlikely the solution will meet business objectives. "Sometimes this means breaking development requirements into smaller parts and prioritizing them based on which can be developed efficiently and effectively first. 6. Does your mobile partner assume end-to-end responsibility for the project? A mobile project can only be successful if there is a clear understanding of the business strategy, application goals, requirements, and priorities of the individual components and features. From inception to deployment, the mobile partner should take responsibility for all considerations and have a clear view of the big picture objectives - including those that may only come into play down the road. 'It's the mobile development partner's responsibility to identify the core features needed to get a working first version and what features should be rolled out in future versions," Jagani observed. "Placing this responsibility squarely on your mobile partner's shoulders ensures that he has skin in the game - and your mutual success as priority number one." Call us at 484-892-5713 or Contact Us today to learn more which things to consider when partnering with Mobile App developers or Mobile App development team. In the past, when developing web or desktop applications, one or two robust versions of the application would be enough to accommodate users of most browsers and operating systems. However, there are many different form factors in the mobile marketplace, including the iPhone, Android, and BlackBerry. cardshopdirect.com stocks a wide range of cheap birthday cards, Christmas cards, greetings cards and others for all occasions.